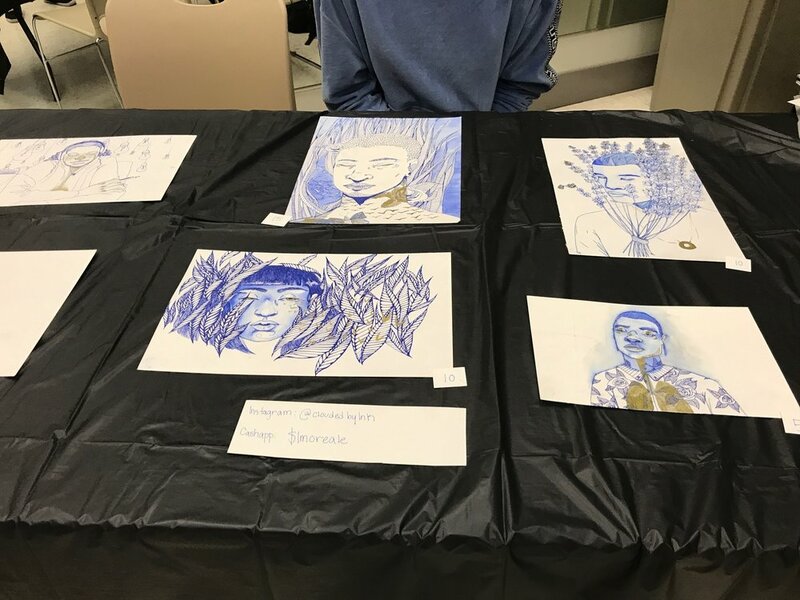 The Black Student Union’s Freshman Council closed out Black History Month with an art showcase held at Nyumburu Cultural Center on Sunday, Feb. 25. On Sunday, Feb. 25, the Black Student Union Freshman Council hosted an art showcase at the Nyumburu Cultural Center. Going along with the gold and black color scheme, the name “Golden Age Art Show” worked perfectly for the show. Flier courtesy of Freshman Council. Artists brought their work, social media signs, price tags, and decorations around 2:30 p.m. to begin setting up for the show. Doors opened at 3 p.m. and attendees walked from table to table learning the deeper meaning behind the artwork. One artist I had the chance to speak with was Jasmine Garcia, a freshman studio art major. Garcia’s interests span across three main mediums: oil painting (which is her personal favorite), watercolor (which she just started last year), and pen drawings (which she had on display at the art show). Jasmine Garcia, freshman studio art major, put her line drawings on display at the art show. To illustrate her line drawings, Garcia uses Pilot Precise rollerball pens. You can follow Jasmine’s work on Instagram @cloudedbyink. Photos by Amina Lampkin. Garcia is interested in capturing current topics of today that really move her. She wants to make other people question what they believe to be true. She has done series of work on health issues, the indifference in response to school shootings, and gender expression. Another series that Garcia completed was about how her recent diagnosis of diabetes affected her. Her favorite piece was a self portrait with several suns orbiting around her, while clouds filled the sky above. The suns represented the hot flashes that come along with her diabetes, and the clouds represented how low in spirit she was. Garcia’s line drawings at the art showcase were between two main topics: black men and nature. The images of plants were used to portray feelings of serenity and serve as metaphors for life. These images also combined her line drawings with gold watercolor accents. Garcia’s point of expression was no different from many of the other showcasing artists and performers who used their medium to convey the important aspects of their identities. The Prima Dolls, a dance organization on campus, performed a tribute to 2nd Lt. Richard Collins III. Ifechukwude Nwando Arah, a sophomore sociology major with a certificate in African American studies, brought paintings that referenced different parts of black pop culture. Ifechukwude Nwando Arah, a sophomore sociology major with a certificate in African American studies, was one of 14 showcasing artists at the show. Arah’s pieces vary in size, as well as subject matter. Photo by Amina Lampkin. Misha Bucknor, sophomore kinesiology major, not only brought her paintings, but did a live painting session at the show. Photo by Amina Lampkin. The Council also expected the showcase to be a marketing opportunity for the artists. The freshman council came up with the idea of the Golden Age after deciding that they wanted to do something in honor of all the black art on campus, Tamya Anderson, freshman criminology and criminal justice major, said.